Fellowship Hour: 11:00 a.m. - 12:00 p.m. We have coffee, snacks, and fellowship follow the service. Holiday Services include Advent services, Christmas Eve service, Lenten services, Easter sunrise service, and others. Dates and times for these services will be posted at the top of this page. Office Hours are Tuesday through Thursday from 9:00 a.m. - 12:00 p.m. The office telephone number is 781-767-0992. Our History Winthrop has ministered to the community since 1818. To read more of our history, click here. Pointing To God and Reaching Out To People. We Covenant with the Lord and with one another and do bind ourselves in the presence of God, to walk together in all His ways according as He is pleased to reveal Himself unto us in His Blessed Word of Truth. March 31st (Sunday): Free for all week. No particular meeting place. 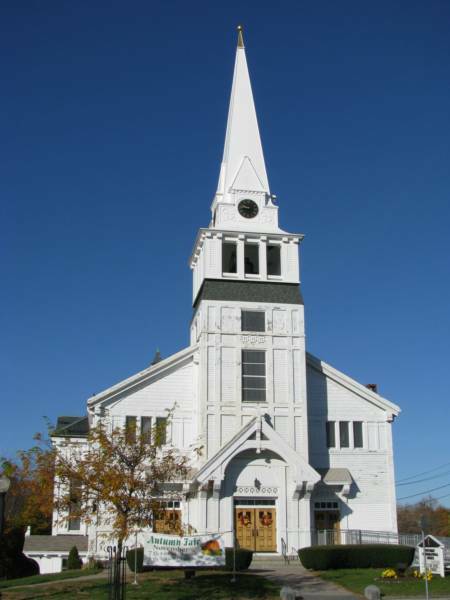 Some will be going to Brookville, Alexa and I are visiting one of her home churches in West Bridgewater and I know some have been going to the Methodist. Feel free to go wherever you like. April 7th (Sunday): Service and Acceptance of 3 New Members @10:00 at Alexa and My House. We will be outside if the weather is nice. If not we will be inside. If you have a portable outdoor chair, we recommend bringing that. Feel free to bring snack food. April 14th (Sunday): Palm Sunday Service on Front Lawn of Church @10:00 if weather permits followed by fellowship at Chris and Tina's house which is walking distance from the church. If weather does not permit outside then all of the service will be at Chris and Tina's. Feel free to bring snack food. April 18th (Thursday): Maunday Thursday Service @ Methodist Church @7:00pm. This is the service of the foot washing that the Methodist hosts every year. All are welcome. - Easter Sunrise Service: Service at the Church @6:30am followed by breakfast at Rob and Amanda's. Any carpooling that can be done for the 5-10 minute drive would be appreciated. Judi, we may want to change the sign letting people know where the congregation will be meeting for Easter Sunrise Service and Easter Service or perhaps just one if only one will fit. It seems like a lot and if anyone needs any clarification or has questions you can call Marcia Baker at 781.293.2992. Lord willing we can get back into our building soon but remember, we are the church. This is a time of reflection and connecting with our other brothers and sisters in Christ. We are all of one body. Lets never forget that. God bless all and I look forward to seeing you in the coming weeks.